The Miami Dolphins are quickly becoming known as Lion poachers, as for the second time this off-season and third time in the the last two, they have plucked a player off the Lions roster. It was announced today that receiver/returner Ryan Grice-Mullen will join teammate Rolly Lumbala in Miami this year. Both will be reuniting with former Lions star Cam Wake. Both will have to make the roster, but barring an early cut, the Lions will be without their services at training camp and to start the season. Grice-Mullen started the season at wide receiver for the team, but was in and out of the lineup with inconsistent play. He really started to develop as a kick returner in the second half of the season, and that skill-set was no doubt what attracted the Dolphins to take a look. Grice-Mullen joined the Lions during the 2008 season, and only played in a few games, before assuming a bigger role this year with the departure of Jason Clermont and the move of Paris Jackson to the slot. Grice Mullen had 20 receptions for 210 yards and a 10.5 yard average last season, while contributing 43 punt returns for411 yards and a 9.6 yard average and 47 kick returns for 1099 yards, and a 23.4 yard average. His longest kick return was 73 yards. Lowell Ullrich of The Province reports that Grice-Mullen and Lumballa both received minimal signing bonuses which would make them easy cuts. But so did Stefan Logan last year who went on to play for the Pittsburgh Steelers and set a team record for returns in the process. 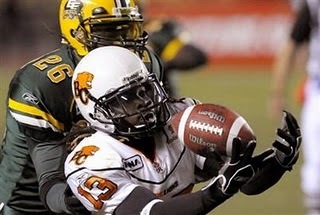 The BC Lions returned to the practice field Monday after another loss on their record, and some new faces on the field. With holiday Monday and a beautiful day to take in practice, I ventured down to the Surrey training facility to check out our lethargic Lions. As was rumored Sunday by @littlemissCFL on Twitter, and posted on BCLionsden.ca, the Lions announced the signing of linebacker JoJuan Armour on Monday, as well as that of former Edmonton Eskimo running back A.J. Harris and defensive end James Edwards. All three players were at practice and it was instantly recognized that Armour was immediately taking on a starting role with the team. The physical Armour, who started his CFL career with the BC Lions, was taking all of the first team reps in Javy Glatt’s middle linebacker position, while Glatt watched from the sidelines. This move was later confirmed by Armour who told the Team 1040 that he was assuming the middle linebacker position. Glatt can hardly take all the blame for the team’s defensive woes. The defensive line has been at fault as well, and there are questions about the scheme of the defense itself. But the fact remains that something had to change, and the with the Lions giving up an average of 150 yards rushing per game,the middle linebacker position was a good place to start. There was no scheme change, with Armour and McKenzie being joined by Korey Banks in certain situations as the nickleback. It will remain to be seen how much the scheme itself has to do with the Lions lack of success with the run, now that Armour is in the mix. A.J. Harris didn’t seem to have as much of a prominent role at Monday’s practice, and Martell Mallett seemed to be taking all the first team reps, with Darren Toney and Ryan Grice-Mullen returning punts. According to Lowell Ullrich, Buono confirmed that Harris is here for the time being as insurance behind Mallett, and because Ian Smart was due to have surgery today on his banged up knee. With an average of 5.6 yards per carry last season for the Eskimos and good hands coming out of the backfield, it was not a bad insurance policy to take a chance on. I’ve attended a few Lions practices over the last few years, and one thing was noticeable off the bat at this one, there wasn’t a lot of talking going on. Korey Banks quipped “We still have fans? Really, we still have fans?”, as he jogged out to the practice field, but the usual banter amongst players was muted at best. Wally Buono took a much more hands on approach in today’s practice, particularly on special teams drills where he was fairly vocal. Buono’s style is usually to sit back and let his coaches run the practice, but obviously desperate times call for a more involved role from the boss. For those still dreaming of the return of Stefan Logan here is an update on his quest to make the Pittsburgh Steelers.